Pre-order your own copy of The Dogwich Legacy at your local retailer or online through our website today! In The Dogwich Legacy, the Order of Dead Rodents on the Doorstep has taken hold of Barkham, tipping the scales in the unseen war that has raged on for centuries. 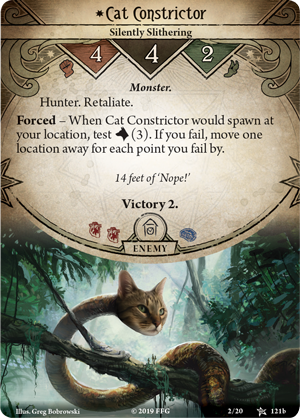 While the struggle is old as time itself, a newly unearthed book, the Necro-nom-nom-nom-icon, has given the Order unnatural abilities—turning select members of their feline ranks into horrific creatures that now hunt for flesh. 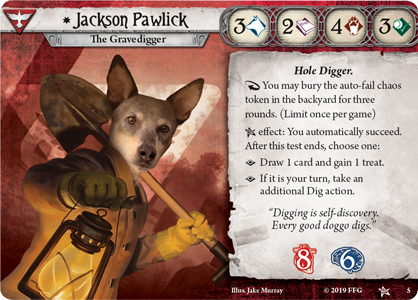 Barkham’s only hope is the brave puppers, doggos, and good boys who will tirelessly dig for answers and sniff out the truth. The Dogwich Legacy offers two unique scenarios to challenge your team. Hisses in the Dark finds you doggedly working on a strange case that has troubled you for weeks—all of the tennis balls in the city have disappeared. Just as you were beginning to scratch the surface, you lost the scent when your witnesses suddenly refused to talk, not even for milkbones. Some instinct tells you they have been intimidated by the city’s elite feline organization, the Order of Dead Rodents on the Doorstep. Your investigation is interrupted when you hear a desperate yowling from the woods behind your home. Running outside, you find an unfortunate canine, head stuck in a maddening cone. A note is attached to the collar: "The Chewer of Corpses shall hear our call. The bones of all who oppose her shall be picked clean." As you struggle to free your canine companion from their plastic prison, you hear twigs snap around you. 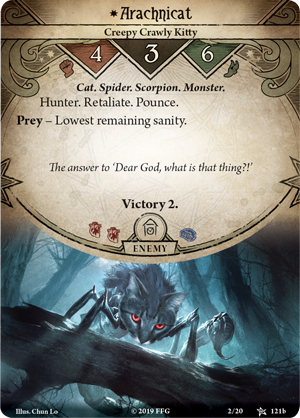 The hunter becomes the hunted as you evade pouncing terrors like the Arachnicat (The Dogwich Legacy, 121), and slithering monstrosities like the Cat Constrictor (The Dogwich Legacy, 121). This new witness may be the crack in your case, but only if you can survive long enough to question them! If you ever make it back to Barkham, In the Claws of Evil tasks you with exposing the Order and ending their reign of kitty terror. You have learned the Order's true aim—they wish to make a sacrifice and invoke Bast, so the cat goddess may merge Earth with Ulthar and create a world without canines. There is no telling what will become of the dogs of Barkham or their beloved humans if this fate should come to pass. No matter how many squirrels may cross your path, you must maintain your focus and stop the Order! If you hope to stand against the Order of Dead Rodents on the Doorstep, you must unite a new team of investigators, braver and furrier than any you have seen before. 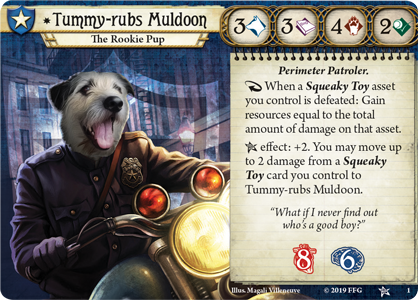 The Dogwich Legacy introduces a cast of five new investigators, each with a weakness for car-rides and belly rubs: Wagatha Dane (The Dogwich Legacy, 2), Tummy-rubs Muldoon (The Dogwich Legacy, 1), Pupper Mutteo (The Dogwich Legacy, 4), Jackson Pawlick (The Dogwich Legacy, 5), and the roguish Rex Murphy (The Dogwich Legacy, 3). But not THAT Rex Murphy. No one would ever think that Rex’s name lends itself oddly well to a canine theme and then write an entire paragraph about it… that’d be weird. Rex was once an esteemed journalist, content to live his wiggly, peanut-butter-filled life… until it all fell apart. Rex has always had a nose for a story and an eye for detail, but the newspaper kept him on a short leash. Just when he was on the cusp of uncovering a great conspiracy, a groundbreaking story that would make his career, a report about Rex himself reached the public. A troubling exposé revealed that only eleven out of ten humans would boop the snoot. 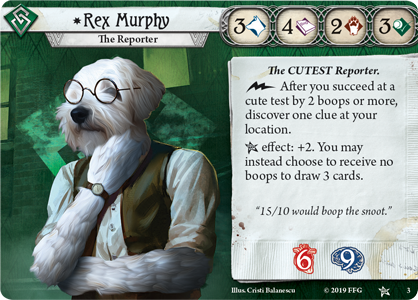 His fluffy trust betrayed, Rex took on a new life dedicated to the chasing the truth no matter the cost, even if it meant sharing treats with Barkham’s less-reputable characters. 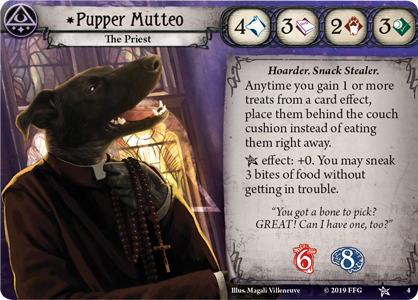 He is still a good boy, but with his renewed dedication to digging up answers, he may once again prove that he is the goodest of good boys. Like any investigator, Rex is troubled by more than just the nightmares that haunt the streets of Barkham. 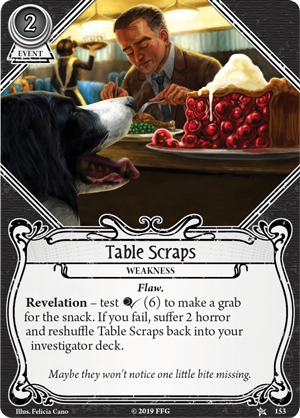 If Rex cannot overcome temptation, he may be forced to face a new weakness, Table Scraps (The Dogwich Legacy, 153), which presents the ultimate challenge for an agile pupper. 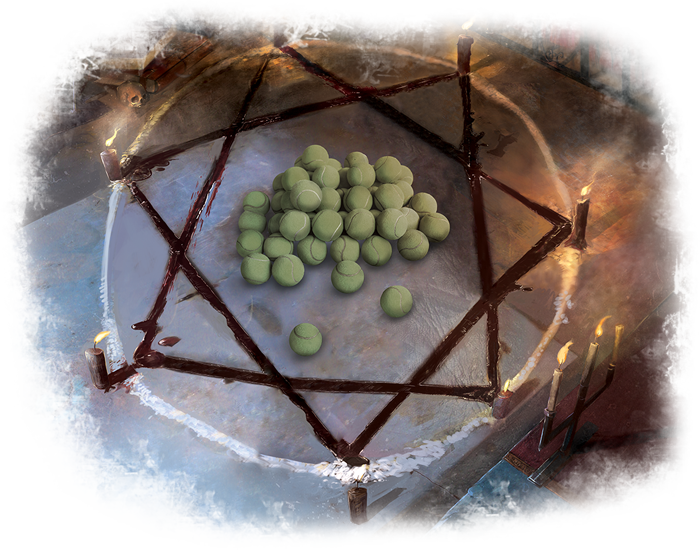 When this weakness is revealed, the investigator who drew it must test their agility to make an unnoticed grab for the snack. If they fail and their human sees, they are sure to be scolded, suffering two horror for disappointing their person and shuffling Table Scraps back into their deck as they continue to wonder what human food tastes like. Yet in this Flaw, investigators see the entire reason for saving Barkham—if the world is destroyed, there will be No. More. Treats. The Order of Dead Rodents on the Doorstep have ears in every corner of the city and their dark powers set them apart from any enemy you have yet faced. It takes man’s best friend to fight for all mankind. 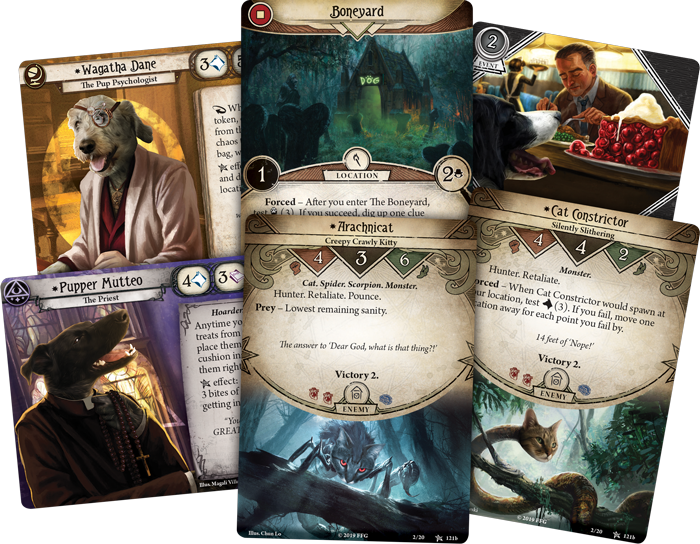 The destiny of Barkham is in your paws—do you have what it takes? 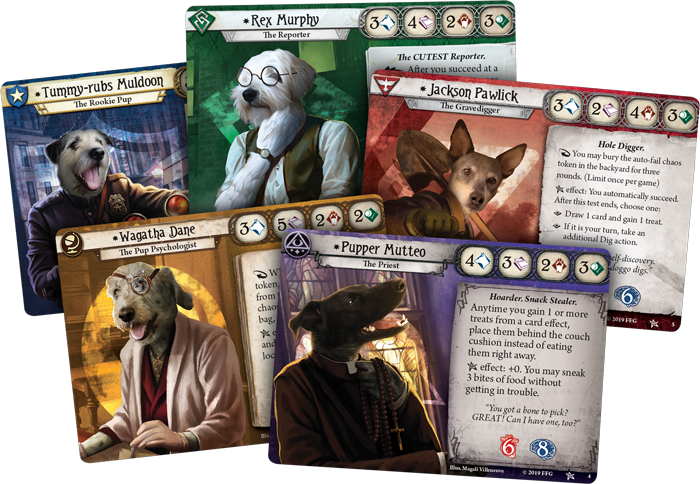 Pre-order your copy of Barkham Horror: The Card Game (BARK01) online through our website today here! 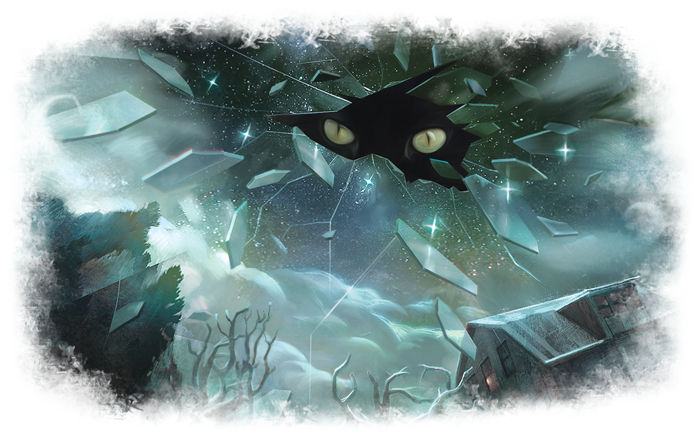 Otherwise, look for this hair-raising adventure when it hits shelves on April 1, 3019! 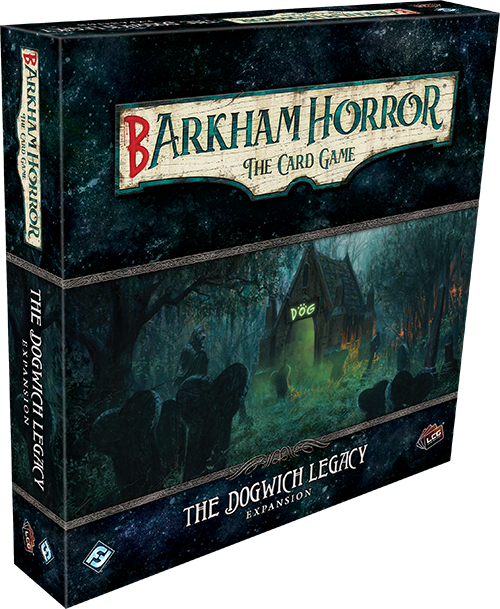 Barkham Horror: The Card Game is a cooperative Living Card Game® set amid a backdrop of Lovecraftian horror. 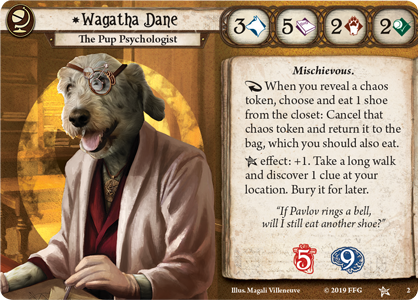 As the Ancient Ones and their feline minions seek entry to our world, one to two good doggos (or up to four with two Core Sets) work to unravel arcane mysteries and conspiracies.